Mr Dempsey and his family are very concerned about the dust disease. Pic Mike Batterham. 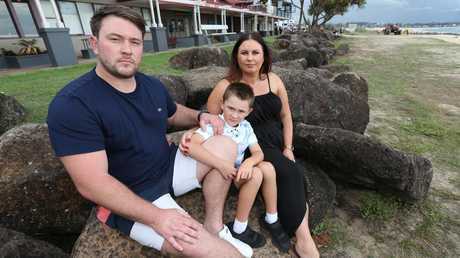 A DISEASE dubbed "the new asbestos" is killing Gold Coasters - and those most at risk say they can't even get tested. 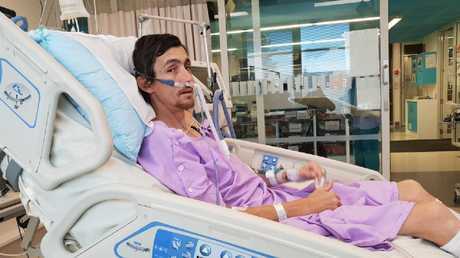 Matthew Dempsey, 28, has breathed in the deadly Silica dust every day for the past decade either as a stonemason in NSW or technician in Queensland, servicing the machines used to cut materials. "I work on the machines every day and there's covers that I pull off that have dust building up on them for five years - it goes all over your face," Mr Dempsey said. 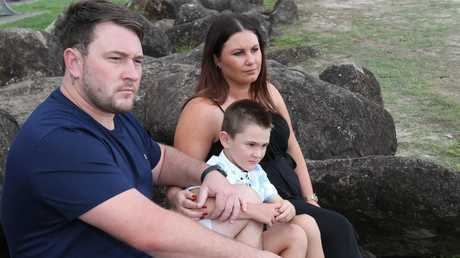 Stone Mason Matt Dempsey with his wife Maria Dempsey and son Hunter Dempsey age 6 of Kirra. Pic Mike Batterham. 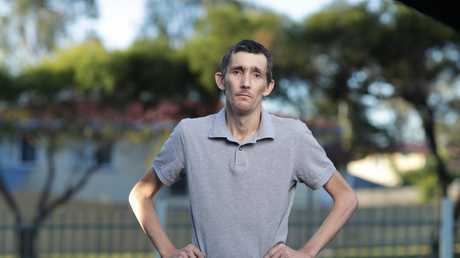 At least seven people have contracted silicosis in sheds Mr Dempsey has worked in across Queensland, including Gold Coast man Anthony White, who died this month aged 36. "They said if I feel sick to go see a GP, but we haven't been educated. I don't know what I'm meant to feel if I've got silicosis," Mr Dempsey said. "If I wait until I feel sick it's too late then. Anthony White, 36, died earlier this year after contracting silicosis. Picture by Luke Marsden. "Do I just wait until I fall over and drop dead like Anthony did? "I saw a big change in him in just six months and then all of a sudden he wasn't there anymore. "I'm getting married this year. I have a six-year-old son, it's put my life on hold." of silicosis - an irreversible lung disease contracted through breathing in crystalline silica dust from artificial stone benchtops. 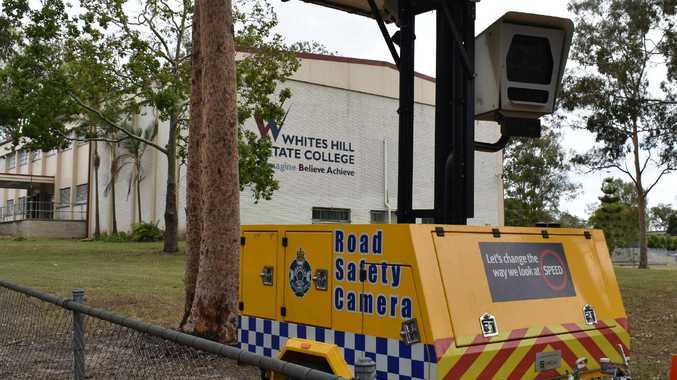 More than a dozen cases have been detected on the Gold Coast in recent months. A WorkCover spokesman confirmed yesterday thatthe free screening only covered stonecutters who had worked specifically in Queensland. Industrial Relations Minister Grace Grace said anyone with concerns can go to their GP if they wish to be tested. "No Queenslander who works with silica will be denied access to health monitoring, assessment or access to worker's compensation if diagnosed with silicosis," she said. "I want to see this matter resolved as quickly as possible and ask if the worker suspects he has been exposed that he contact his GP immediately for a WorkCover referral." Mr Dempsey said the spread of the disease could be enormous. "I've come home with dust all over me. My partner washes my clothes and breathes that in. Anthony White before he died. Picture by Luke Marsden. "My son sits in the car which gets covered with dust inside. "What about the receptionists who walk in and out of the sheds, external electricians or plumbers that do jobs in there? It's airborne, anyone could be affected." A public screening test is available through GP clinics involving X-rays, CT scans and possibly a biopsy, but Mr Dempsey said it should be WorkCover's responsibility to check for dangers he may be exposed to at work. Shine Lawyers dust disease expert Roger Singh, who represented Mr White before his death, said it was concerning to hear people were being turned away. "It's only fair and reasonable to extend the screening to individuals who have worked in a stonemason-type environment and they should not be discriminated against," he said. State Shadow Industrial Relations Minister Jarrod Bleijie said it set a "dangerous precedent" to refuse testing. "I remember asking about black-lung disease a couple of years ago and why they weren't screening people and covering people," he said. "It's exactly the same situation, they should be on top of it."